Silencing a beeping alarm panel? Operating your Denalect Alarm system? 1. Close doors and windows. Display should read SYSTEM READY / ZONES NORMAL. If not, see “Bypassing a Zone” (below). 2. Enter your Code. If leaving, press ARM. If staying, press AUX-ARM. You have 40 seconds to exit via an Entry/Exit Door. If the system is on when you enter, the keypad’s buzzer will sound. You have 40 seconds to enter your Code. Red light will turn green. When arming your system, you can bypass an open zone (i.e. like a door or window) on the keypad. 2. Press SCAN to see the name of the open zone or zone number. 3. Press BYPASS to bypass that zone or go close the door or window. Repeat SCAN and BYPASS for all open zones. 4. When finished, press CLEAR, then ARM or AUX-ARM to start arming the system. 1. Enter your Code and press CLEAR. 2. Wait 30 seconds, then call Denalect Alarm at 925-935-2680. 1. Display will show AC Failure. When there is a fire, the bell rings intermittently. When there is a burglary, the bell rings steadily. 1. Enter in your Code, this will silence the bell. 2. Before resetting the smoke detectors, check each one and note which one(s) have a steady red light on. Our service technician will need this information. 3. Enter your code then press RESET to reset the smoke detectors. DO NOT reset the fire alarm unless you are sure there is no fire. If there’s still smoke, the alarm will not reset. Call Denalect at 925-935-2680. 1. Close doors and windows. If secure, keypad displays SYSTEM READY. If not, see “Bypassing a Zone” (below). 2. If leaving, Press 9. If staying, Press 0. 3. Enter your Code. Bypass any zone here. You have 40 seconds to exit. When arming the system, if a zone (i.e. a door or window) is open, you can bypass that zone on the keypad. 1. Press the asterisk (*) button. 2. Press the zone number. 3. Press asterisk (*) again. An on-off warble tone will sound. The display will show Press 4 to View. 2. The display will tell you what the issue is. 3. Press CLEAR to silence. 4. Call Denalect Alarm at 925-935-2680. If AC power failure, wait 15 minutes to call. 1. Enter your Code to silence the bell. 2. Check each smoke detector to see which one(s) have a lamp on. Also check the heat sensors. 4. Enter your Code to reset the system. Reset will take 20 seconds. 1. Press the 6 button. 2. Enter the Master Code. 4. Enter the user number of the Code you want to program. 1–6 (8 for the Duress Code). 5. Enter the new Code. 6. Enter the Code again. 8. Test the new Code. 1. Close doors and windows. If any zone lamps are blinking, see “Bypassing a Zone” (below). 4. Bypass any open zones here. You have 40 seconds to exit. The ON lamp will blink. If the system is on when you enter, the keypad’s buzzer will sound. The ON lamp will go out. When arming the system, if a zone lamp blinks showing a zone is open (i.e. 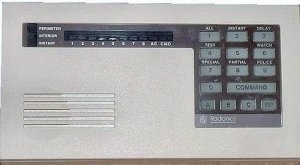 a door or window), you can bypass that zone using the keypad. 1. Press the zone number button. An on-off warble tone will sound. The OK lamp will blink. 4. Call Denalect Alarm at 925-935-2680. If AC power failure, wait 15 minutes before you call. 1. Close doors and windows. All zone lamps should be out. If any zone lamps are lit, see “Bypassing a Zone” (below). 2. If leaving, press Command 1. If staying, press Command 3. The perimeter and interior/instant lamps will go out. When arming the system, if a zone lamp (i.e. a door or window) is lit you can bypass that zone. This will arm your system and any open zones. Interior zones will also be bypassed. An on-off warble tone will sound. 2. A lit AC lamp means system is normal. 3. A blinking AC lamp means your system is operating on the backup battery. 4. 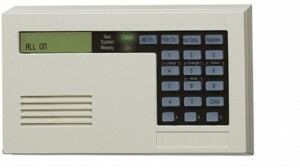 Call Denalect Alarm at 925-935-2680. In the case of AC power failure, wait 15 minutes to call. 3. Wait 30 seconds, then call Denalect Alarm at 925-935-2680. 2. Press the Enter Button to silence bell. 3. Check each smoke detector to see which one(s) have a lamp on. The reset will take 20 seconds. 2. Enter the Code that you would like to change. 3. Enter the new Code, keeping the same FIRST digit as the old Code. 4. Enter the new Code again. 1. Close doors and windows. 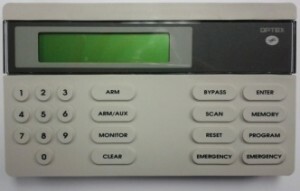 If secure, keypad displays SYSTEM READY, OK FOR ALL ON. If not, see “Bypassing a Zone” (below). 2. If leaving, press ALL ON. If staying, press PART ON. When arming the system, you can bypass a zone (i.e. a door or window) on the keypad. 1. Press the zone’s number button. 2. Press the asterisk (*) button. This will arm your system as well as any open zones. An on-off warble tone will sound and the display will read PRESS CMD 4 TO VIEW. 3. Call Denalect Alarm at 925-935-2680. In case of AC power failure, wait 15 minutes to call. 2. Check each smoke detector to see which one(s) have lit lamps. 4. Enter the user number of the Code you want to program, 1-30, followed by the asterisk (*). (31 for Duress Code). 7. Press CMD to exit.